The Sawmill Suite is a private apartment located in the heart of Old Town Chemainus, adjacent to our local lumber mill on the water. 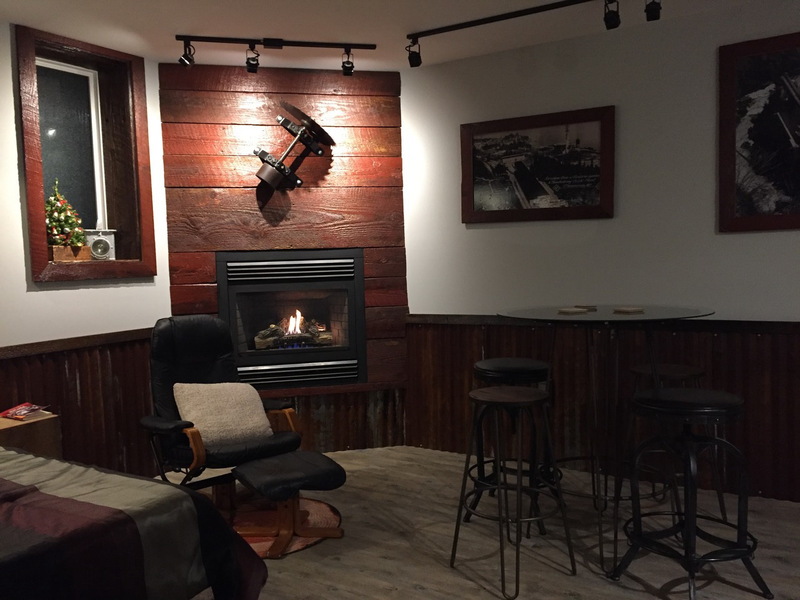 This new suite has a rustic, industrial, sawmill theme with all the luxuries of present day. Included in the 700 sq ft suite is a kitchenette with stove-top, microwave, fridge and dishwasher as well as two TVs that offer a wide range of channels with Roku and free Netflix and WiFi. Tea and coffee is also provided. The bathroom has a full-size tub and shower and heated towel rack. There is a gas fireplace inside and a private courtyard patio with BBQ and propane fire pit, as well as outdoor games. It can sleep up to 6 people. The suite is wheelchair accessible on one level with a door code entry and parking. We are a smoke free accommodation and do not accept pets. It is within walking distance to everything including the beach, marina, live theatre, shops and restaurants. Chemainus is famous for its murals on local buildings including this one. A hidden gem that will amaze you when you walk through the door.